What is chocolate? 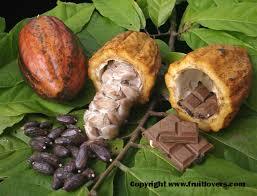 Chocolate is a product of the fruit of the cacao tree. The fruit grows off the main trunk of the tree as pods, similar in size to a deflated football. The trees can grow anywhere from 25 to 50 feet tall. Once harvested, each pod is cut open to reveal a milky white or pastel-hued pulp, with loads of beans—20 to 50 per pod—embedded. Split apart, cacao pods have characteristics similar to a melon but with much larger seeds (cacao beans) and little flesh. The vast majority of cacao trees grow within rain forests where the climate is very warm and humid, roughly 20 degrees north and south of the equator. Forestero is by far the most common and prolific cacao, due to its hardiness and resistance to diseases and pests. Stout and tannic forestero beans are fermented for about a week to mellow them. Grown primarily in Africa, forestero beans are the workhorses of the chocolate world. 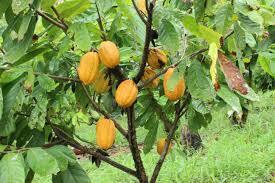 Africa accounts for about 70% of the world’s production of cacao. Criollo beans are considered the highest grade and are used for top-quality chocolate blends and many single-bean chocolates. The elongated criollo pod is low yielding and vulnerable to disease, making the beans far more costly. The majority of fruity and aromatic criollo beans are harvested in Venezuela; the rest comes from Indonesia and Madagascar. They are low in astringency and require less fermentation, about 3 days. Criollo beans account for only about 5% of the total world production of cacao. Trinitario cacao is a hybrid of forestero and criollo, created on the island of Trinidad. Trinitario cacao was developed to be less resistant to disease than criollo beans, like forestero beans, but to possess many of the same fruity qualities as the sought-after criollo. The best trianitario beans are from java and, of course, Trinidad. Harvesting of the cacao pods is quite difficult. Since the trees are too fragile to allow workers to climb, the pods must be harvested at ground level with tumadores, machete-like “cacao blades” mounted on long handles. Once the pods are harvested, they’re sliced open, revealing light-colored beans surrounded by a creamy white, pastel pink or soft violet-hued pulp. The fermentation takes place in pits dug in the earth or in wooden crates. Once heaped into the pits or crates, the cacao beans and their gluey pulp are covered with banana leaves and left to ferment. Fermentation turns the sugars into acids and changes the color of the beans from pale color to a rich, deep brown. Once fermented, the beans are sun-dried. During the drying process, the beans lose most of their moisture. As the beans are laid out to dry, they are manually raked and turned daily to ensure even drying. Sun-drying takes about a week, and the growers use this opportunity to pick through and remove any foreign matter from the beans. Once dried, the beans are packed into canvas or woven polypropylene sacks for shipping. Once cacao beans arrive at factories, they are unloaded and sorted for foreign objects. Then the cacao beans are carefully roasted to a temperature between 210 and 290 degrees f. After they’re roasted, they’re expelled from the hot roaster and cooled quickly. Next they are passed through a winnower, which cracks the dusky outer shells from the beans and blows them away. The meaty, valuable inner bean is crushed into smaller pieces, known as ‘nibs’, to be made into chocolate. Cacao nibs are high in fat, about 50 percent. They’re crushed into a paste, using granite stones or heavy-duty metal, a process that can take several hours or several days. During this time, the fatty nibs are continuously rolled and ground, generating heat and releasing the cocoa fat, which helps them liquefy until a smooth paste is formed. This paste is called “chocolate liquor”, although it contains no alcohol. The process is called “conching”. Cacao refers to the pod (cacao pods), the beans within (cacao beans), and the pure paste of the bean (cacao paste or cacao “liquor”). Cocoa is the powder made from the cacao bean, which is mashed into a paste then pounded to extract the cocoa butter and pulverized into a dry powder. It is believed the name “cocoa” came about as a result of a mis-spelling by early english traders. Nowhere is the deforestation and devastation of the planet’s rain forests more evident than in the troubling patterns now seen in the cultivation of cacao. Cacao is a fragile crop. The tiny pink flowers that cover the branches of the cacao tree need to be pollinated, which is mostly done by small insects. This occurs naturally in a balanced rain forest ecosystem, but now, because the balance has been disrupted, hand pollination is often required. As the popularity of chocolate increases each year, worldwide demand for cacao increases at a rate of about 3% annually. In west africa, farmers are clearing land to grow cacao, deforesting the low-level trees while maintaing a few of the higher trees, which provide necessary shade. The problem expands as eventually pests and disease strike these unprotected trees, and farmers respond by clearing even more land for new cacao plantings. If growers and manufacturers are to keep up with increasing demand, it is vital that the rain forests remain as stable as possible so that the young cacao trees can thrive in their much-needed shade. In addition to the threat of deforestation, cacao trees are subject to a variety of ailments, most notably witches’ broom, a devastating spore that cannot be eliminated, or a fungus known as black pod rot, which infects the entire cacao tree. More than 75% of the brazilian crop was destroyed by an infestation of witches’ broom between the mid-1980’s and 1998, apparently spread by human error. Even today nearly 25% of the annual cacao harvest is destroyed by the disease. Baking chocolate---baking chocolate is sold in bars that are in general 60% cacao paste and 40% sugar. Since they are intended for baking only there is no added cocoa butter. Baking-resitant chocolate---most of us are familiar with baking-resistant choclate in the form of semisweet choclate morsels. These chips are considered “baking-resistant” because they retain their shape during the heat of baking due to the decreased amount of cocoa butter added to the chocolate. Compound “chocolate” coating---not chocolate at all, compound chocolate-flavored coatings contain sugar, cocoa powder, vegetable fat, and sometimes chocolate liquor and cocoa butter. The appeal of using compound coating is that it eliminates the need to temper the chocolate. Couverture---in general, couverture, or “coating chocolate” is semisweet or bittersweet chocolate with extra cocoa butter added. The extra cocoa butter improves the texture and flidity. Gianduja---gianduja refers to milk or dark chocolate compounded during the manufacture with roasted hazelnuts. Ground chocolate---although ground chocolate resembles cocoa powder, it’s actually pulverized sweetened chocolate. It is mostly used to make chocolate drinks. Milk chocolate---milk chocolate must contain a minimum of 10% cacao solids and 12% milk solids (dried). Sugar is always added and usually a small amount of lecithin as well. Semisweet and bittersweet chocolate---both must contain a minimum of 35% cacao solids. In addition, sugar is added for sweetness and cocoa butter for fluidity and smooth mouthfeel. Lecithin is often added and sometimes vanilla. In spite of what you hear, semisweet and bittersweet chocolate are interchangeable terms. Sweetness and bitterness are determined by the manufacturer, so unless the recipe specifies, you can use one in the place of the other. 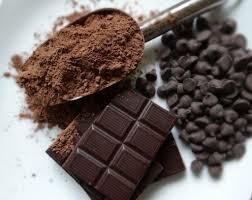 Sweet chocolate---more of a snacking confection and rarely used in baking, must contain at least 15% cacao solids. Most of us are familiar with the ibarra brand used for mexican-style hot chocolate. Unsweetened cocoa powder--- unsweetened cocoa powder is made from warm chocolate liquor (unsweetened chocolate paste), which is slammed through a powerful hydraulic press, separating the cocoa solids from the cocoa butter. What remains in the press after the cocoa butter is removed is a very hard, dense compressed disk of cocoa. The rock-hard compressed cocoa cake is crushed and pulverized into cocoa powder, which contains between 10% and 22% fat. “Dutched cocoa powder”---cocoa powder (or cacao nibs before they are ground) that has been washed with a harmless alkali solution of potassium carbonate to neutralize the acidity and darken the powder. Black cocoa--- black cocoa is highly alkalized cocoa powder. Although lacking in rich chocolate favor, it is usually used to intensify the darkness (think oreo cookies). Unsweetened or bitter chocolate---unsweetened chocolate is solid “chocolate liquor”, cacao beans ground to a smooth paste with no added sugar or fat. White chocolate---not officially (or legally) chocolate because it has no cacao solids. White chocolate is made from cocoa butter and sugar, with added dairy solids and sometimes vanilla.